Obama’s visit to the Mosque was more exciting than mine! | Notes From America ! Obama’s visit to the Mosque was more exciting than mine! It is ironic that while Obama is sending drones to kill Muslims abroad, an Islamophobe like Ronald Trump calling just for banning them. Obama Visit to the Mosque was more exciting than mine! I’ve got the feeling that Obama’s recent visit to a mosque in Baltimore is kind of too little, too late. (“In mosque visit, Obama decries anti-Muslim bias,” Feb. 4). It is ironic that while Obama is sending drones to kill Muslims abroad, an Islamophobe like Ronald Trump is calling just for banning them. While Republicans think Muslims just don’t fit in the U.S., Obama, on the other hand, Obama thinks Muslims fit right in here in America–once they make it alive to enter this country. “Let me say as clearly as I can as president of the United States: you fit right here,” Obama assured thousands of Muslim Americans at the Islamic Society of Baltimore, who came to listen to the first black president of the United States. This was probably not the first time Obama had visited a mosque His father was a Muslim, which has been a scar that has followed him all of his life. According to a September CNN poll, 29% of Americans believe Obama was a Muslim, including 43% of Republicans. Obama joked about such notions in his mosque visit, saying the same rumors had stained Thomas Jefferson. “I am not the first,” he said. “I am in good company,” he added. This business of visiting a mosque to talk to Muslims is in itself an indicator of a kind of Islamophobia. Besides Obama’s recent visit, Bush visited a mosque after 9/11 to talk to Muslims. However, a mosque is not the only place you can meet Muslims, and not everything a Muslim does is Islamic. Why couldn’t Obama meet Muslims in a non-religious context at a community center, at schools, shopping malls, restaurants, or even a sporting event? Americans seem to have a medieval views of mosques; many seem terrified of them. The American fixation on attacking mosques in this country is puzzling considering that America prides itself on the sacredness of private property. Here, angry Americans attack and burn mosques, which is the Muslim place of worship, in contrast with angry Muslims abroad who attack and burn American flags, which is a political symbol. Obama assured us that this is not a war with Islam or Muslims, but that this is a war on ISIS/ISIL, or Daesh. So, ask yourself, why don’t angry Americans burn ISIS flags instead of mosques? A big chunk of Americans who have never visited a mosque think the mosque is a breeding ground for terrorist jihadists. Mosques, unlike churches, have no membership or denomination. Any group or imam can start up a mosque if they are allowed. If you don’t like a particular mosque, you simply go to another one or build your own. Imams build their own mosques not to preach jihad but mostly to ask for money to fix the roofs or bathrooms! One mosque here is run by a group of imams who are interested more in dead Muslims than lives one. They run the biggest Muslim cemetery in the state, and charge $5000 a head; for them a good Muslim is a dead one. The role that mosques play in Muslims’ lives and belief system is way overstated. I go to mosques periodically and I have never seen such a bunch of bored Muslims as those who are exposed to the so-called jihad preaching. Imams, for the most part, are unqualified self-appointed preachers, not well-versed in religion or in effective communication. And here is a tip that may help Islamophobes in this country: Nothing disperses a crowd of Muslims like an imam’s sermon. In fact, some people carefully plan their Friday prayers to miss the sermon. More Muslims meet after Friday prayers for social gatherings than actually during the prayer. The only jihad I have when I go to the mosque is trying to do “Wudu” (pre-praying wash) without falling on the bathroom floor. “Cleansing is part of the faith,” says our prophet. Muslims come from all over the world with different personal hygiene customs and toilet etiquettes that often require special devices. Most bathrooms in America aren’t equipped with the right devices, such as foot-bath or “Shattaf” (bidet toilet). And since toilet paper wont cut it, Mosques will improvise by providing alternative like a plastic water cans for performing “al-Istinjah ” ; washing your private parts after urination or going to bathroom . This is the most humbling experience anyone goes through, it would even take any violence tendency out of a terrorist. I even recommend it to our law enforcement and Home Land Security to consider it into their CVE, Countering Violent Extremism program. The biggest jihad of them all at the mosque is finding my own shoes after prayer. Muslims usually come late to prayer, and they are always in a hurry. They insist on taking their shoes off without using their hands, so shoes end up scattered everywhere, losing their paring system and the place would look like a bomb has just been dropped. 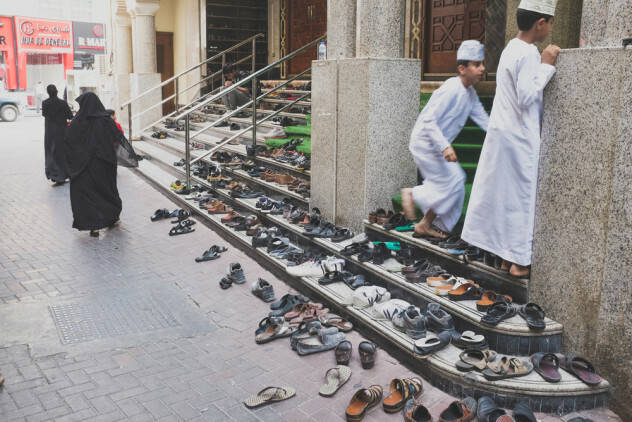 People often spend more time looking for their shoes after prayer than actually praying. Some will end up wearing whichever shoe they can find or fit in. Yes, at the Mosque there are many jihads a Muslim is exposed to, but none of them is much like the one that Donald trump and Fox News spew everyday.